Many people have a horrible fear of chainsaws. But with the right use, at the right hands, chainsaws can be an excellent labor saver. However, there are certain considerations you have to make before you go and buy a chainsaw. The size, location of the work area will be the probable factors that will determine where you need corded, gas or battery operated chainsaw. To understand the right chainsaw to fit your needs, you need to understand the power options available on the market. The key advantages of buying a gas powered chainsaw are the remarkable portability and power you will enjoy. These kinds of machines range from light to heavyweight or professional grade saws. They are the ones applicable in felling large-sized trees. Most feature two-cycle engine and operates on a mixture of gasoline and oil. Most feature pull- start and you can mix the fuels yourself or by premixed ones. These ones have taken the market by a storm. They are cleaner than the traditional types of chainsaws and can deliver incredibly high amounts of torque. They feature a smaller design than the gas-powered chainsaws. However, the truth is that they don’t surpass the gas powered saws. Thus they are only ideal for small jobs such as trimming and pruning. These ones fall under the electrical saws category. However, they use a rechargeable battery instead of a direct connection to power. So, they don’t have a power cable. However, the voltage limits these devices in terms of the scale of performance. Nevertheless, recent models use incredibly strong batteries that increase the runtime enabling you to handle a big wood cutting job. Apart from power options, you can also categorize the chainsaws in terms of the design and the features they possess. We have standard saws and the pole saws. These ones feature a rear and front handle placed on an engine casing. The other part of these standard saws is the cutting bar that extends from the engines cover. This is the common design even though you will never lack to encounter some variations. They are best for heavy duties such as cutting entire trees and large thick limbs. Despite their intense power, they have limited reach. So, you are forced to use a ladder when doing tree pruning and other activities. As the name suggests, these types of power saws feature a small saw that is mounted on a long pole. They are light and provide a great work when trimming tall branches. Most of these models feature extendable poles to allow comfort when dealing with different tree heights and branch lengths. This telescoping handle delivers comfort to allow different people to choose the desired length to work with. As you may not believe it, some models can convert between standard and pole chainsaws. Technology always has an ending room for improvements. Apart from the standard and pole saw designs, there is another design that features an enclosure inform of jaws surrounding the cutting bar. This enclosure offers more protection from the rotating chain. Other models feature a scissors design and cut by first clamping the object you are cutting. However, they are only good for light pruning activities such as when maintaining the fence. Buying a chainsaw does not only involve targeting specific brands. Even though the brand matters a lot, it is important to evaluate some other factors. The type of the tree you will be working on mostly is also very important to consider. Also, your experience really matters on the kind of chainsaws you are supposed to buy. While size is a crucial factor, many people don’t know how to determine the size of a chainsaw. Now, bar length will give you a clear insight of the size you are dealing with. It can also indicate the magnitude of the work it can handle. The longer the bar, the wider the diameter of the tree it can cut. The best one should be able to cut a medium-sized tree on a single pass. Most chainsaws have a cutting bar with length ranging from 6 to 20 inches. However, professional grade chainsaws will have a cutting bar that is more than 20 inches. Voltage, amperage, engine displacement, horsepower are all connected to power and capability of any machine. So, even for the chainsaws, you should consider higher numbers. The higher these numbers are, the more powerful the tool is. The point to note here is that numbers matter a lot if you will be dealing with hardwood trees and large trees. Nevertheless, these powerful chainsaws have got some limitations too. For instance, the heavier the engine, the more you are likely to experience fatigue or exhausted quickly. In addition, larger saws tend to produce a lot of vibration which can impact negatively on your health if you work with the machine for a long time. As much as size matters a lot, you need also to be cautious about comfort and your safety while working with these chainsaws. In any particular chainsaw, you need to consider the following comfort and safety features. We all agree that too much vibration can damage your nervous system if you don’t consider some precautions. However, manufacturers have realized that this is becoming a major concern and are now incorporating certain features that reduce these vibrations. 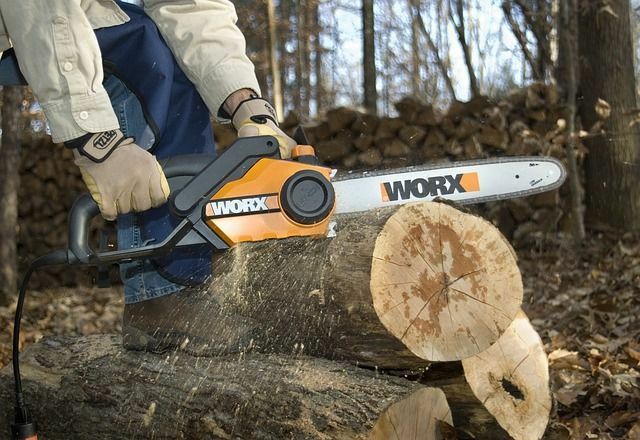 With these features, you can comfortably work with your chainsaws comfortably for long hours. This is an important thing to consider if you are working with gas-powered chainsaws. The spring assists in reducing the pulling effort to require starting the engine. Lubrication is the key to increasing the engine’s life. It also applies to the chain part. So, automatic oiler is a feature that will relieve you from the burden of oiling the saw regularly. Human is prone to forgetting and you can end up compromising the condition of your machine. But, with automatic oiler, you don’t have any stress. This is a safety feature which every chainsaw user should be versant with. It is meant to stop the chain when the device encounters abrupt movement. Besides, on equipped models, you can as well activate the chain brakes. Chain requires regular maintenance which involves making some adjustments. Sometimes you are required to change the chain tension when cutting some materials depending on their hardness. Adjusting the chain should be very easy without even using some tools. This is also a safety feature that prevents the risk of the saw from being triggered back and up. Together with a chain brake, you can be sure that there would be no risk when tackling strenuous tree cutting jobs. This is an important feature that can increase the durability of your chainsaw. This feature prevents debris from reaching the filter of your machine. That way, the device can operate smoothly and efficiently. There are other specifications you need to check before buying a chainsaw. First, you need to check the gauge of the chain and ensure it fits the groove in the bar. In addition, you need to check the pitch. This is the spacing between the rivets of the chain. It is proper to check and ensure it matches the spacing of teeth in the sprocket. As you have seen, it is very easy to choose the best chainsaw. We have discussed the various types of chainsaws based on a number of criteria. Also, we have seen that there are many things to factor in when selecting the best brand or model. Safety, comfort and performance features must never be overlooked when buying the best chainsaw. Whether you need corded, cordless, or gas powered chainsaws, you can now select the best without making any blunders.